One Dowry Murder Every Hour! Shocking statistics have been released by the National Crime Records Bureau (NCRB). 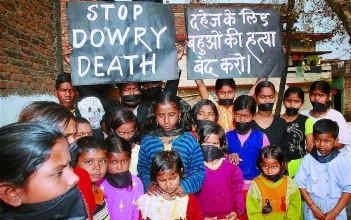 Their figures state that 8,233 dowry deaths were reported in 2012 from various states. The statistics work out to one death per hour. Suman Nalwa, additional deputy commissioner of Delhi Police (Special Unit for Women and Children), said the problem is not only limited to the lower or middle class. "Higher socio-economic strata is equally involved in such practices. Even the highly educated class of our society do not say no to dowry. It runs deep into our social system," she said.